In this modern-day Cinderella story with a charming twist, a young widow with two rambunctious sons falls for a gorgeous movie star. But can she handle life in the limelight? When Kelly Reynolds’s husband died two years ago, he left her to raise their two young boys. She’s barely pieced herself back together and takes refuge in her routine, running her kids around town and running the trails near their Idaho home. A chance encounter on a trail run brings famous actor Andy Pettigrew into her life. He’s clearly interested in her, but Kelly hates risk, and a love affair with Andrew is certainly tempting fate. She doesn’t fit into his Hollywood world. She doesn’t own a pair of Louboutins, and she couldn’t walk five steps in them if she did. Andrew oozes cool. She reeks of dork. As an author of a contemporary romance set in the celebrity world of Hollywood, I’m always interested to read someone else’s inside perspective on a movie star’s life. 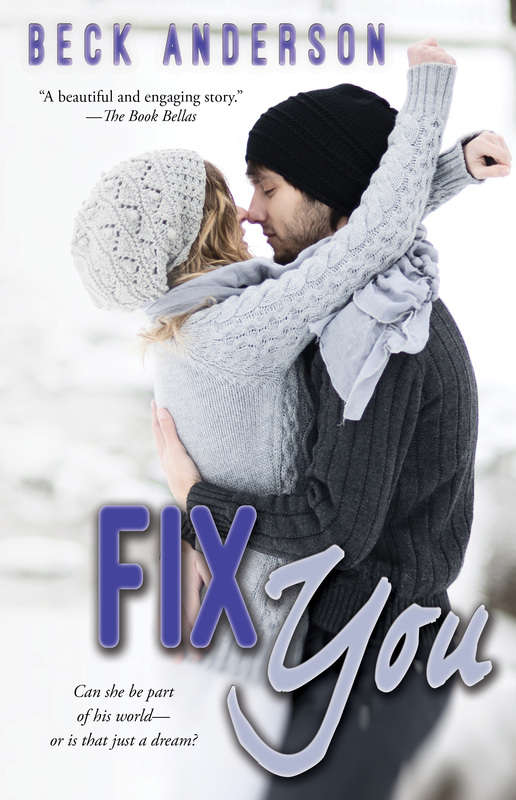 Having already read another one of Beck Anderson’s novels, I was confident I would be treated to a good story in Fix You. I’m happy to report that was exactly the case. Both Fix You and The Jeweler feature heroines who are dealing with loss and grief, which can be a difficult emotion to write about. It can be easy to over-dramatize the emotions associated with deep loss, just as easily as it can be to underwhelm a reader with a character’s apparent lack of feeling while mourning a loved one. Just as when one writes about love, there is a fine balance to be maintained when addressing the delicate subject of death and grief. Beck Anderson has proven to me, not just once but twice, that she can convey these complicated emotions organically with her characters and I greatly admire this skill of hers. When Kelly Reynolds loses her husband at the beginning of Fix You, the reader is taken along on her journey to mourn and to move on with life so that she can remain an involved and caring mother for their two children. In the process of recovery, Kelly finds herself on vacation with her sons and her parents in California. One morning she goes out for a jog and ends up running into one of the world’s most sought after movie stars. One brief introduction to Andy Pettigrew, the famous actor, leads to another brief interlude and soon Kelly finds herself easing into a most unlikely new friendship. “Remember when you were first learning to drive?” I take another deep breath. I’m not sure if I’ve been breathing in any reliable way since we crossed the condo’s threshold. “But your point?” I think he’s kind of grinning. At me. He could be close to laughing. “Where do I look?” This has devolved into a social etiquette class offered by a movie star to a woman whose mind has completely left her in her moment of need. “You can always look at me.” He looks up from the mug, right into my eyes. I agree. I think I could look at him for a nice long while. Naturally, Andrew (as he prefers to be called) prefers to keep his personal life as private as possible, and given the situation Kelly is currently working through her mindset is in a similar place. The two enjoy a budding but secret friendship, and when Andrew makes an unexpected visit to Kelly’s hometown of Boise, he soon finds that her quiet lifestyle is exactly the kind of life he dreams to call his own. The two spend limited time with one another but quickly come to rely on each other for a much needed change of pace from their individual normal routines. Content in their bubble of distraction, Kelly and Andrew easily find ways to avoid sharing some of their deeper personal struggles with one another, but as their affection for one another begins to grow hiding these issues becomes more and more difficult. Both Kelly and Andrew are in mentally fragile places and Fix You soon transforms into a dramatic love story as a result. I’ve enjoyed reading Beck Anderson’s books recently and it is easy to see why Fix You was picked up by Gallery Books for a re-release. Beck is a skilled storyteller and she navigates her characters quite naturally through some very extraordinary circumstances. As a reader, I experienced a wide variety of emotions while immersed in the story and practically read this book through in a single day, after finding it nearly impossible to set down. For those of you who enjoy a good Hollywood novel or a story about finding love a second time around, I highly recommend Fix You. I happily rate it 4.5 stars! Beck Anderson loves to write about love and its power to heal and grow people past their many imperfections. She is a firm believer in the phrase “mistakes are for learning” and uses it frequently to guide her in writing life and real life. Beck balances (clumsily at best) writing novels and screenplays, working full-time as an educator, mothering two pre-teen males, loving one post-40 husband, and making time to walk the foothills of Boise, Idaho, with Stefano DiMera Delfino Anderson, the suavest Chihuahua north of the border. This entry was posted in Books, Books For Review, Reviews and tagged Beck Anderson, Books, Books for Review, Fix You, reviews.